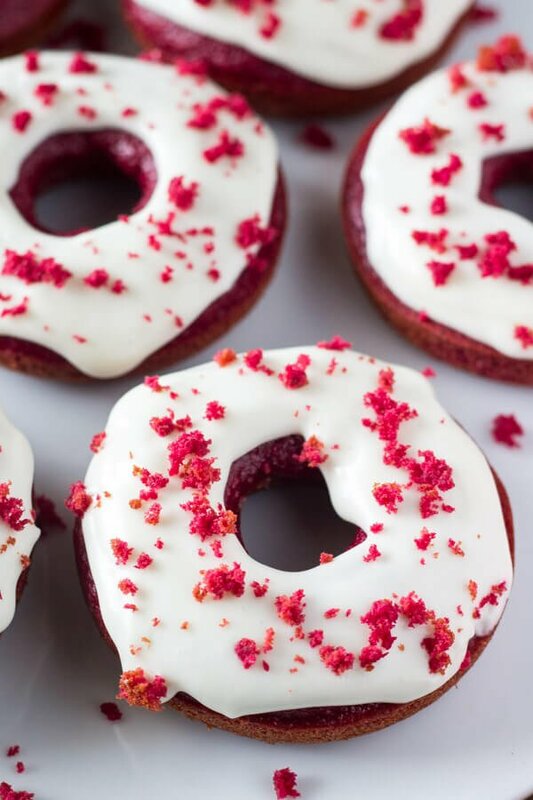 The BEST Red Velvet Doughnuts imaginable. Soft & moist with the perfect cake doughnut crumb, a delicious red velvet flavor and a cream cheese glaze. These baked doughnuts are perfection. Ever since I made Red Velvet Chocolate Chip Cookies for Valentine’s day I’ve been dreaming of new red velvet recipes. You see – I used to reserve the flavor just for red velvet cupcakes. But clearly I shouldn’t be so narrow minded. 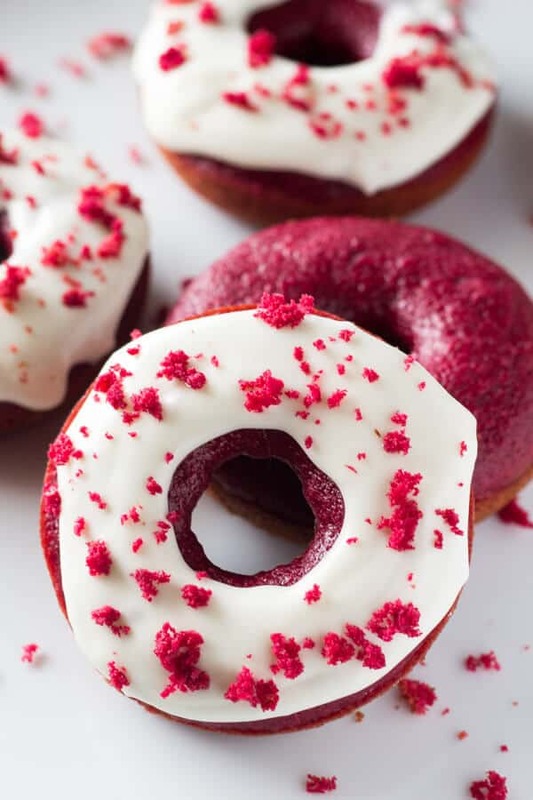 So to start on our quest to incorporate red velvet into EVERY dessert category, today we’re making Baked Red Velvet Doughnuts with Cream Cheese Glaze. 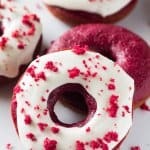 They have that quintessential red velvet flavor that’s somewhere in between chocolate & vanilla, a completely moist crumb with the perfect cake doughnut texture, and a deliciously sweet and slightly tangy cream cheese glaze. Not to mention – that pretty red velvet color. Now to make these red velvet doughnuts (just like any baked doughnut recipe in fact), it’s very straight forward. We whisk together our dry ingredients (flour, a little cocoa powder, baking soda, and sugar), then the wet ingredients are mixed together separately. Then the wet ingredients get poured into the dry and everything is whisked together until the batter is just combined. Be careful not to over mix the batter. Otherwise your doughnuts will be tough instead of perfectly soft and tender. What else makes these so soft, tender & moist you ask?? Buttermilk & sour cream. 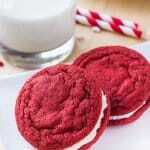 Buttermilk is a key ingredient in red velvet that gives that je ne sais quoi. Plus it makes for the softest cake crumb. Then the sour cream acts as insurance against dry baked goods. Make sure your buttermilk and sour cream are warmed to room temperature before you add them to the batter. A quick 15-20 seconds in the microwave does the job if you’re short on time. 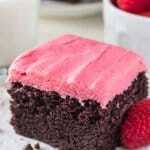 Then for the red velvet color, I used a whole 1 tablespoon of liquid red food coloring. The color was definitely vibrant, so feel free to use only 2 teaspoons if you prefer. But let’s be honest. 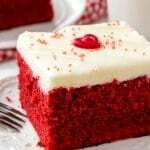 The real reason why we all love red velvet is because of the cream cheese frosting. 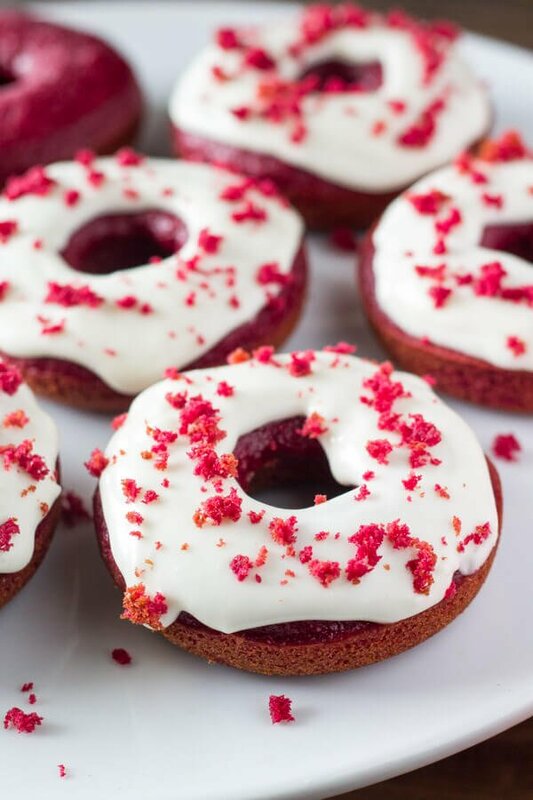 These red velvet doughnuts have a super delicious cream cheese glaze. For decoration, I crumbled up a doughnut and sprinkled it on top of the other tasty morsels. But that’s totally up to you. 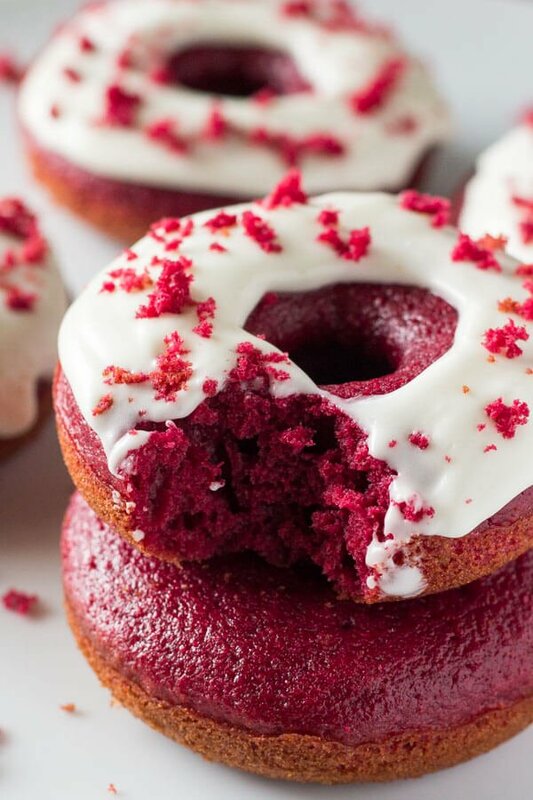 So for today’s red velvet to-do list… These baked red velvet doughnuts totally make their mark in the hall of fame. Preheat the oven to 350F degrees and spray a doughnut pan with non-stick cooking spray. You'll end up with about 6-8 doughnuts total, so you may need to bake them in 2 batches or use 2 doughnut pans. In a separate medium-sized bowl whisk together the melted butter, egg, vanilla, sour cream and buttermilk. Ensure all the wet ingredients are room temperature before mixing them together. Otherwise the butter will form clumps and the mixture won't be useable. Then whisk in the food coloring and distilled vinegar. Add the wet ingredients into the dry ingredients and whisk until just combined. Be very careful to only mix the batter until they're just combined. Spoon the batter into a large ziplock bag, cut the bottom corner off so there's about 1/2 inch opening in the bottom corner. Then pipe the batter into the prepared doughnut pan. Or spoon the batter into the doughnut pan. Each doughnut cavity should be about 2/3s and you'll end up with about 6-8 doughnuts total. Bake in the preheated oven for 8-10 minutes or until the doughnuts feel slightly firm to the touch. Allow to cool for 5 minutes in the pan, then continue cooling on a wire rack. In a medium sized bowl whisk or stir together the butter and cream cheese until combined. 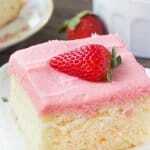 Add in 1 cup powdered sugar and 1 tablespoon of cream or milk and whisk until combined. Add in more powdered sugar and cream until the desired sweetness level is reached. The consistency should thinner than peanut butter. These look absolutely amazing!!! I know we’re a bit far away from this holiday but wouldn’t these make the most perfect Valentine’s Day treat? So indulgent! I think these would be gone in no time at my house! I love the color so much.Yumm.. Thanks so much! I always find getting that perfect red velvet color can be tricking, but when you do it’s just way too pretty. Oh my word. Dangerous! These doughnuts are so dangerous! I love the tip about microwaving 15-30 secs to get the sour cream and buttermilk to room temperature. I always forget tot set them out when a recipe calls for that! Pinned! Glad it helps! I have so little patience, so I’m always searching for ways to save time! Let me know what you think of the recipe! Can they be stacked? Does the glaze harden? Sometimes I find the glaze hardens enough to stack, but not always – just depending on the temperature. If you want to ensure that they can stack – I’d use a royal icing instead for the glaze.